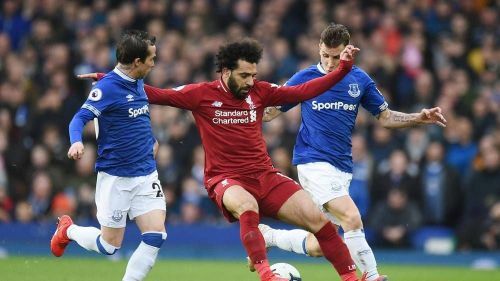 Liverpool's title hopes dealt with yet another blow after a goalless stalemate to Everton at the Goodison Park as Manchester City are back at the summit. The Reds, coming off the back of three draws in five previous games, needed a win to preserve the top spot. However, the Toffees frustrated their mighty neighbors with some brilliant defending though not conjuring up anything special up front. Mohamed Salah, Roberto Firmino, Fabinho, and Sadio Mane all came close at various points in the match, but none could find the back of the net. Unlike the goalless draw to Manchester United last week, Liverpool fashioned better and more clear cut opportunities here. However, the result was the same, courtesy of some frustrating wastefulness in the box. 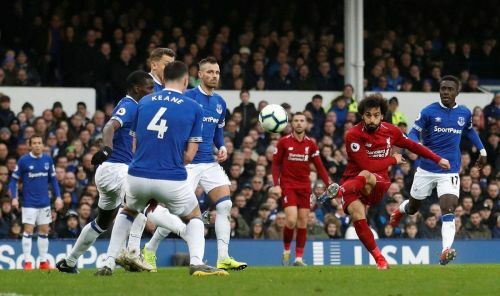 Liverpool had left the Toffees on the tenterhooks with a fast start to the match, but the first real chance fell to Salah when he caught the Everton defense napping and ran through on goal, but was denied by Jordan Pickford when one-on-one. Later on, Fabinho was presented with another opportunity but was late to react to a loose ball as Lucas Digne cleared the danger with a crucial interception. Salah then came to a cropper again when his poor cross was easily caught by Pickford as Liverpool once again broke forward in a promising counter. Frustrations in the Liverpool camp were simmering by now, and Firmino did little to water it down when his header off a corner harmlessly bounced off to irrelevance. Despite creating numerous chances and taking 10 shots, the visitors were left undone by an annoying lack of end product. If Liverpool are to really win the league, they need to rediscover their swashbuckling best which swatted teams aside in the first half of the campaign.